is the oldest land trust in North Carolina and among the first 20 in the United States. The summit of Satulah Mountain was the first property purchased by the Highlands Improvement Association in 1909. Later this association would eventually evolve into the Highlands-Cashiers Land Trust. HCLT originated in 1883 with the creation of the Highlands Improvement Association (HIA), a group created to “protect, preserve, and promote the natural beauty of Highlands.” They began this effort with trail-building and tree-planting improvement projects. In 1909, the HIA collected $500 and bought 56 acres on Satulah Mountain that was slated to become a hilltop hotel. The Highlands community thought it better to look at a mountain rather than a hotel, a notion that is still in vogue today. The HIA promptly built a stone shelter for the benefit and protection of those who “wanted to spend the night for the purpose of beholding the beauties of the sunset, starlit heavens, and the glories of the sunrise.” The foundation of that structure is still there. The Land Trust has added to that initial purchase and today owns nearly 70 acres on the summit. Another landmark, Sunset Rock, was donated by the Ravenel family in 1914. These 10 acres overlook the town of Highlands to the west and Horse Cove to the east. The view from Sunset Rock has been the most popular vista in Highlands for generations. The HIA merged with the Highlands Community Club in 1934 to form the Satulah Club. Another merger with the Ravenel Park Association in 1987 resulted in the Highlands Land Trust. Up to this point these organizations had focused on the stewardship of their two holdings, with the formation of this new group there was a greater interest in land protection through purchase ad accepting donations. With the recognition that the Cashiers area was beginning to experience development, the Highlands Land Trust expanded its area of interest to include Jackson County and changed its name to the Highlands-Cashiers Land Trust. During the 1960-1980s several tax incentives provided land trusts with a variety of new tools: the charitable deduction and the conservation easement or agreement. The donation of land to a land trust is seen as a one-time charitable tax deduction. 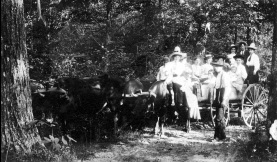 The other tool, the conservation easement, has been around since the 1880s and was used to protect parkways near Boston and later was very important in the creation of the Blue Ridge Parkway in the 1930s. With a modern conservation agreement, the owner of a property maintains ownership but permanently restricts development and future use of land. The development rights are given to a qualified non-profit entity such as a land trust to hold and monitor. In 1996 the Land Trust accepted its first conservation easement on the six-acre Ralph and Louise Sargent tract next to the Highlands Biological Station. Since then, we have gone on to accept 875 acres in conservation easements in both Macon and Jackson Counties and we currently protect over 2,500 acres in 71 places.